Your one-stop location for accessing and managing your personal university information. Spend less time and energy finding the information you need. The UM student portal was designed to work on all devices. So you can truly access the information you need, whenever you need it. You can look at your calendar when you grab your phone in the morning, show your latest grades on your tablet during lunch with mom or download course materials when you are working on your laptop. The information is laid out in such a way that you'll see the most important information first. We have a lot of information and offer a lot of functions for you to complete your study. For this we use complex data systems. However, our goal is to make it as easy as possible for you to access your information and perform your tasks. That is why we integrated all these systems into one new system with one single login. 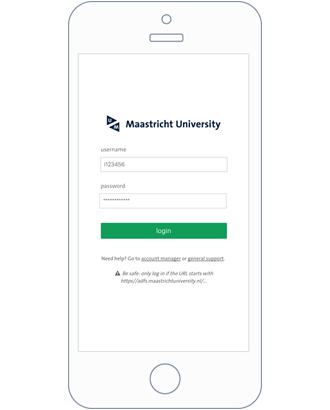 So if you want to access your course material, answer your e-mail and browse your calendar you only have to login once. The student portal shows you the latest announcements and tells you when you have new grades so you're always up to date. It alerts you about your upcoming deadlines so you never have to miss one. This means you can spend less time and energy looking for information and more time studying. 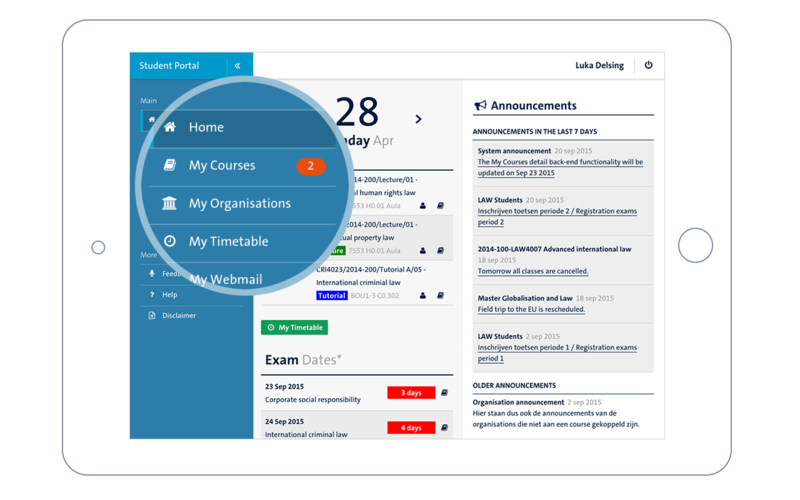 The student portal is tailor-made to suit student needs. This means you won't be seeing any functions, links and tabs you never use. 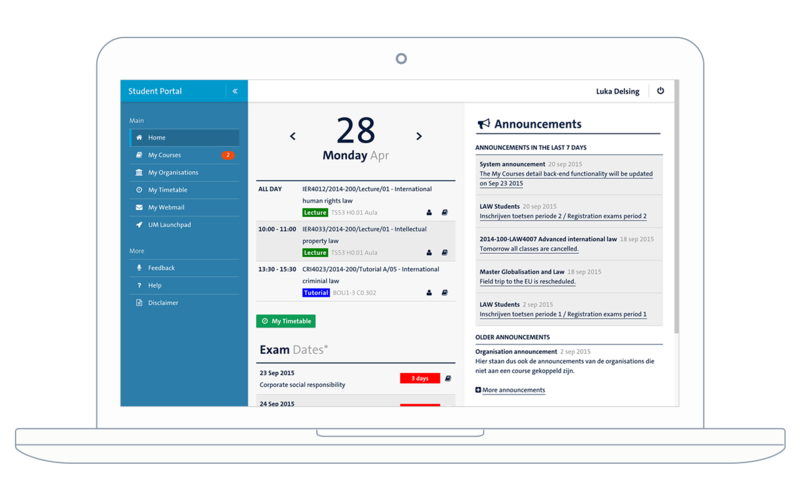 The clear design gives you a better overview of all relevant information and functions you need to complete study related tasks. 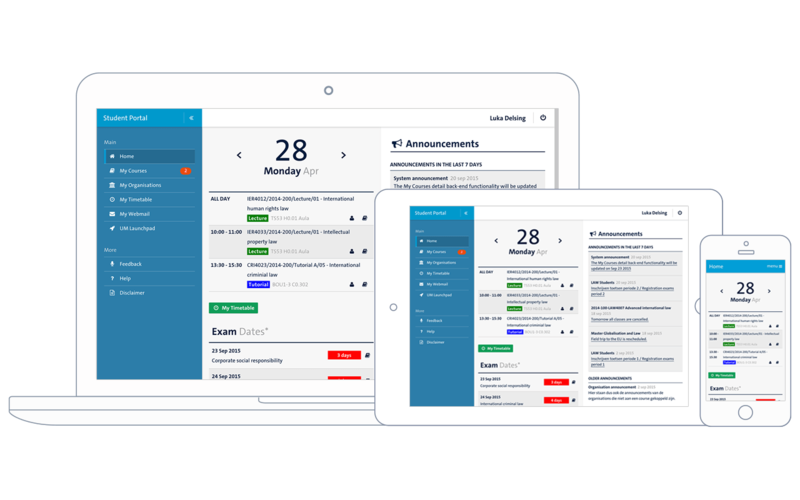 Tasks like registering and deregistering for exams are fully integrated into the new student portal. You immediately receive confirmation if your task was completed successfully and see the changes in de portal interface. Future versions will incorporate more and more of the tasks you need. "A clear, concise portal without an information-overload, without too many tabs, and with an easy-to-use structure. each tab is important. news feed is not obnoxiously present. Only relevant information is shown. I've had experience with at least 4 different portals from different institutes. This one trumps them all." For any questions go to the contact page.